Instead he exhorts us to find a purely spiritual method of communing with the world of spirit. How such a spiritual method might work, he explains in reference to the appearance of Christ in His etheric body beginning during the 20th Century. [page 8] Just as it truly happened — as we have often said — that at the time of the Mystery of Golgotha Christ walked among men in a physical form, in one known part of the earth, so will the etheric Christ walk among men in the twentieth century. This event must not pass unobserved by humanity, for that would be sinning against the salvation of the world. Humanity must have its attention roused, so that a sufficient number of persons may be ready really to see the Christ Who will come and Who must be seen. [page 9] Events seem to be accomplished to-day, in which men appear to be as far removed as possible from any appeal to Christ. We must ask ourselves this question: Who is there to-day who stops to enquire: 'What would Christ Jesus say to what is now taking place?' Who puts such a question to himself? The time will come, Steiner says, when we will begin to ask of Christ with our immortal part, our "I", whether or not we should do something or not. And how are we to learn to ask for help of Christ? We must learn His language. And when we study Spiritual Science, the evolution of humanity through the phases of Saturn, Sun, Moon, and Earth and the different periods, we learn the language of Christ. There is only one Sun that shines on Earth and only one Christ whose vestures are the light that shines from the Sun. [See ARJ: The Apocalypse of St. John and The Gospel of St. Luke for more information on the relationship of the Sun and Christ.] Rightly understood, when we look at a clock or a wristwatch, we are checking on the presence of Christ and His vesture, the Sun, in relationship to our lives at the time. [page 10] If we take the trouble to learn to think the thoughts of Spiritual Science, and make the mental effort necessary for an understanding of the Cosmic secrets taught by Spiritual Science, then, out of the dim, dark foundations of the Cosmic mysteries, will come forth the figure of Christ Jesus, which will draw near to us and give us the strength and force in which we shall then live. The Christ will guide us, standing beside us as a brother, so that our hearts and souls may be strong enough to grow up to the necessary level of the tasks awaiting humanity in its further development. In the olden days, our ancestors lived in direct communication with their ancestors. They saw the world of the Spirit as a daily fact of their lives; they communicated with those who had passed away, and thus, they realized that their friends, family, and those connected to them karmically, had not died, but had merely transited to a new level of existence. Steiner tells us in a spectacular statement, "A thing need not be proved if one knows it!" What we know to be true changes with time and our evolution of consciousness. What we knew once as clear circadian fact has dimmed as our materialistic scientific knowledge grew. Now that our scientific knowledge has grown, our task seems now to assimilate our ancient spiritual knowings with our current materialistic knowings from now on. This is the essence of the evolution of consciousness — to move forward in one area, let that area lay fallow, move forward in another area that is incompatible with the first, then assimilate the two areas into one greater knowing. This is the essence of Spiritual Science — to provide guidance for that assimilation in the centuries to come. Steiner's quote reminds me of what Carl Gustav Jung, a materialistic scientist who devoted his life to learning about the spiritual world, said during a filmed interview near the end of his life when asked if he believed in God, "I do not believe in God, I know!" A thing need not be proven, nor need it require belief, if we know it to be a fact. If we know that there is one Sun whose brilliant light is the vestures of Christ, we can see as a certain fact that the Spirit of the Earth keeps its spiritual face to the Sun and bows in adoration in the course of a complete transit around the Sun. In the back of the Earth Spirit's mind is the darkness of its unconscious. A collective unconscious comprised of all the humans that are asleep in the dark at any one moment, their bodies attached to the Earth, while their Souls, their astral bodies and eternal I's are expanded into the Stars far behind the physical body of the Earth. Sleeping humans constitute a true Star Wave that ebbs and flows in the Universe as the physical body of the Great Spirit of the Earth rotates in space. To the morning crescent of the rotating Earth, Souls are returning from the Stars, infused with new learnings from their voyage. From the evening crescent of the Earth, Souls are departing on their nightly voyage to the deep regions of space. When one comes to truly know this as a fact, the paltry Warp 10 of Star Trek: Voyager seems trivial in comparison to the nightly feat performed by even the humblest human asleep in the arms of Earth. We are sleep-walkers all, sleep-space-travelers all, rightly understood. Who, discovering this to be a fact in their lives, would wish to remove their physical and etheric bodies from Earth to travel only a minuscule portion of the universe with them, when every night their astral and ego bodies travel to the far reaches of the universe? I do not ask you, dear Reader, to believe this. I cannot prove it to you. I only report to you that I know it as a fact in my life. I cannot tell you how or exactly when it became a fact for me, besides it will be different for you when it happens. One of my rules goes this way, "What is the power of an unanswered question?" With these words I originally wished to communicate that holding an "unanswered question" can be a source of power in one's life. I've found it to be so in my own, so I share it with you. What I had observed, which led me to make this observation, is that most folks, when a question is posed to them immediately give an answer and proceed then merrily along as if nothing had ever happened to them. Their answer usually took the form of something they already knew, so they gave the answer they already knew, and learned nothing in the process. Yes, there are many questions that we already know the answers to. "What's your phone number?" is one. Simple to answer. "What's the meaning of Christ in your life?" Not so simple to answer. Anyone who answers that immediately has lost a chance to learn deep truths by simply holding the question as an unanswered question. When the famous hypnotherapist Milton Erickson wished to hypnotize someone quickly, he sometimes used a technique known as pattern interruption. He might, e.g., walk across a stage to shake hands with someone, hold his right hand out, and, just as his hand was ready to meet the other person’s hand, he would stoop down and tie his shoelaces. By interrupting an expected pattern, he was able to put the other person in a deep trance and offer help, bypassing their conscious obstructing mind. From studying his work, therapists have learned that one must create an exquisite confusion in their client or else the client will blissfully drift along in the same stream of hurting as they always have — nothing will change. Sometimes a sudden noise will shake us up, and during those moments, something important will be given us from the spiritual world. In the next section of his lecture on page 16, Steiner develops the Platonic Great Year and shows how it relates to our everyday life. Or rather how our everyday life relates to the cosmos itself. Due to the precession of the equinoxes, the sun rises in a slightly constellation on the morning of the Vernal Equinox — the spring day which has twelve hours of day and twelve hours of night [definition of an equinox]. The place of the Sun in the Zodiac moves each year and after 25,920 years it returns to its original spot in the Zodiac. This comprises a Great Year or great Platonic Cosmic Year. As humans we breathe 18 times a minute, sometimes faster or slower, but over a lifetime, we average 18 breaths a minute. Calculate the number of breaths we average a day and you get 25,920 breaths. "An amazing, but trivial coincidence," the skeptic in you might say. [page 17] A man's life is to a Platonic year as human day to a man's life. When one has breathed 25,290 breaths, one's day is completed. When one has lived 25,290 days, one's life span is completed. In a day's time we have gone to sleep and re-awakened, a process during which our astral and ego bodies leave and return, as if they were breathed out and breathed back in by some being. Just as the air leaves our physical body and radiates into the air surrounding the Earth, our astral and ego bodies must leave the Earth and radiate out into the space surrounding the Earth. We can imagine a Great Being of Earth who breathes our astral and I bodies in and out once during the course of a single day (awake) and night (asleep) or one rotation of its physical body in relationship to the Sun. When humans die, their ego and astral bodies leave the Earth and the region of the Sun, and this can be imagined as a still Greater Being of the Sun that breathes in and out once in the course of an average human life, once every 70.5 years. [25,290 years divided by 365.25] Thus the 70.5 years to the Sun are like 24 hours to the Earth, as 3.3 seconds to a human on Earth. [page 18] You see how it is: — we draw one small breath in the 18th of a minute, which regulates our life; — our life is lived on the earth, the breathing of which comprises day and night; that corresponds with the out-going and in-coming of the ego and astral body into the physical and etheric bodies: and we are ourselves breathed in by the great Being whose life corresponds to the course of the sun, our own life is one breath of this great Being. Now you see that as Microcosms we are actually part of and subject to the same laws, as regards the Universal Beings, as the breath we draw is subject to our own human being. . . . if our hearts are sensitive to the secrets of cosmic existence and not mere blocks of wood, the saying 'we are placed in the Universe' will cease to be abstract words, for we shall be fully alive to the fact. A knowledge and a feeling will spring up within us the fruits of which will be borne in the impulses of our will, and our whole being live in unison with the great Life, Divine Cosmic Existence. [page 25] This meeting is important for man. For all the feelings that gladden the soul with respect to its connection with the Spiritual world proceed from this meeting with one's genius during sleep. The feeling which we may have in our waking state, of our connection with the Spiritual world, is an after-effect of this meeting with our genius. The second meeting happens once a year during the same time that the whole Earth gives itself up to the Spirit. [page 26] . . . at about Christmas-time and on to our present New Year, man goes through a meeting of his astral body with the Life-Spirit, in the same way as he goes through the first meeting, that of his ego with the Spirit Self. Upon this meeting with the Life-Spirit depends the nearness of Christ Jesus. For Christ Jesus reveals Himself through the Life-Spirit. The third meeting happens once in a person's life during the period between 28 and 42 years of age — it is the meeting with the Father-Principle. The changes that happen in one's life during that time, rightly understood, stem from that meeting with the Father-Principle. If one dies involuntarily before one reaches the age of 42, that meeting with the Father-Principle occurs during the hour of death. If one dies by one's own hand before 42, one may be deprived of having this third meeting in this incarnation. In this next passage Steiner gives us a prayer by which we may come to know the "holiness of sleep." [page 58] When a man in his thinking makes an effort to reach the spirit, he will gradually reach it in reality. It signifies that a bridge is thrown across between the physical and the spiritual world. That alone can lead men across from the age of materialism to that age in which they will face the realities, neither blindfolded nor intoxicated, but with vision and poise. Simply said, but very difficult to achieve in this materialistic world where we are blinded to the spirit by the Ahrimanic machines that we use daily and we are intoxicated with the brilliance of our own scientific ideas. It was not always that way. In olden times Man slept all night and was awake during the entire day. [page 60] He did not actually see the physical stars with external eyes; but he saw the Spiritual part of the physical stars. Hence we must not look upon what is related to the ancient star-worship, as though the ancients looked up to the stars and then made all sorts of beautiful symbols and images. It is very easy to say, according to modern science: In those olden times the imagination was very active; men imagined gods behind Saturn, Sun and Moon; they pictured animal forms in these signs of the Zodiac. But it is only the imagination of the learned scientists that works in this, inventing such ideas! The process of projecting one's own way of thinking onto another's is fraught with danger of error, but nowhere as much as when it applied to ancient peoples who lived many levels of evolution of consciousness before our own. "Why did we lose the capability of seeing Spirits instead of physical stars, if it was so good in the first place?" the skeptic will want to know. [page 60] The consciousness of communication with the stars had to recede; it had to be dimmed, so that the inner being of man could become powerful enough to enable him, at a definite time in the future, to learn so to strengthen it that he may be able to find the spirit, as spirit. One key to finding the spirit is to understand the role of the Sun and its intimate connection with Christ — the rays of the Sun, rightly understood, are the vestures, the outer covering of the Christ Spirit. 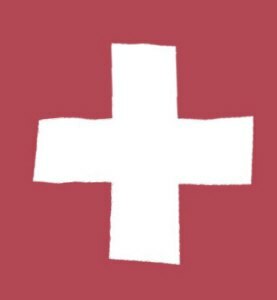 [page 66] The Japanese, Chinese, and even the English and Americans, do not believe that one sun rises and sets for them and another for the Germans. They still believe in the sun being the common property of all; indeed they still believe that what is supra-earthly is the common property of all. They do not even dispute that, they do not go to war about these things. . . . When once people recognize the connection of Christ with these things which men do not dispute, they will not dispute about Him, but will learn to see Him in the Kingdom which is not of this world, but which belongs to Him. Two things, both unconscious at the time, occurred to me that only made sense later when I began to understand the relationship of Christ and the Sun. The first happened on New Year's Eve 1981 when Tenaj, a friend of mine newly returned from a trip to China, was saying goodbye as she left our party. I saw this medallion on her neck and asked about it. She said, "It's a Chinese ideogram, and represents in its symbols "the Sun rising in the East through the trees." When she said that my eyes widened with awe (some part of me knew), and she was so taken aback by my response that she immediately took the silver chain and pendant off and placed it around my neck where it hangs today as I write these words. For years, before I understood the deep connection of Christ and the Sun, I thought of the pendant as a Christ metaphor: He rose in the East from a rude tree. Steiner says on page 68, "The sun rises in the east, and is a beautiful sight; therefore, when it was desired to speak of eternity, the ancients spoke of the east!" The other event happened several years later as I was walking through a large nursery's outdoor displays. 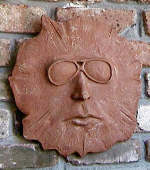 There on the wall was a terra cotta sculpture of the Sun, with a face adorned by sunglasses! It startled me, and I began laughing aloud. My wife, Del, returned later and bought the sculpture for me as a birthday present. Unbeknownst to me at the time consciously (but from my reaction, definitely, unconsciously), it was a Christ metaphor, and it indicated the close connection of Christ and the Sun that I was to learn consciously of later. Perhaps the shades protect His eyes from viewing our blindness and our intoxication with our own brilliant ideas both of which are so rampant here on Earth, up until now. Here's a photo of the sculpture that I took a few minutes ago. [page 84] For when we speak to educated people to-day we must speak of the metabolic body, of the rhythmic body, of the nervous system; we can no longer speak of the mercurial body, of the sulphur-body and of the salt-body. "Of what use is it to know this?" my skeptic friend asks. It helps to know this if one is to understand the words written in ancient texts such as the Gospel of Matthew (5:13) when Christ said to His disciples: "Ye are the salt of the Earth." He was speaking to His disciples, but in a very real way, He was speaking to every one of us today, who living some 2000 years later represent the living nervous system of the Earth.We are the noösphere, as Theihard de Chardin called it, that delicate living nervous system covering the face of this planet. We are the salt of the Earth, and if we lose our savor by getting lost at the end of the path and forget our spiritual beginning, how are we to restore it? When Christ asked that question of His disciples, He was the bearer of the answer. 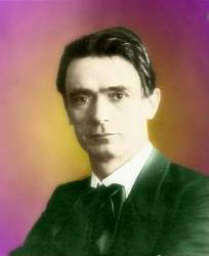 To close this review, I'd like to share a thought inspired by Rudolf Steiner's fine teachings in these lectures that may help some to recover the savor of their consciousness. By the Great Astral Spirits of the Night. 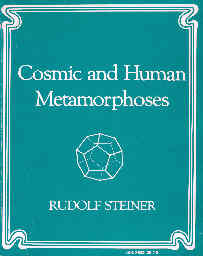 To Buy Rudolf Steiner Books, Click on SteinerBooks Logo below. To Download a Copy of This Book in .pdf Format (~3 Mb) Click Here!